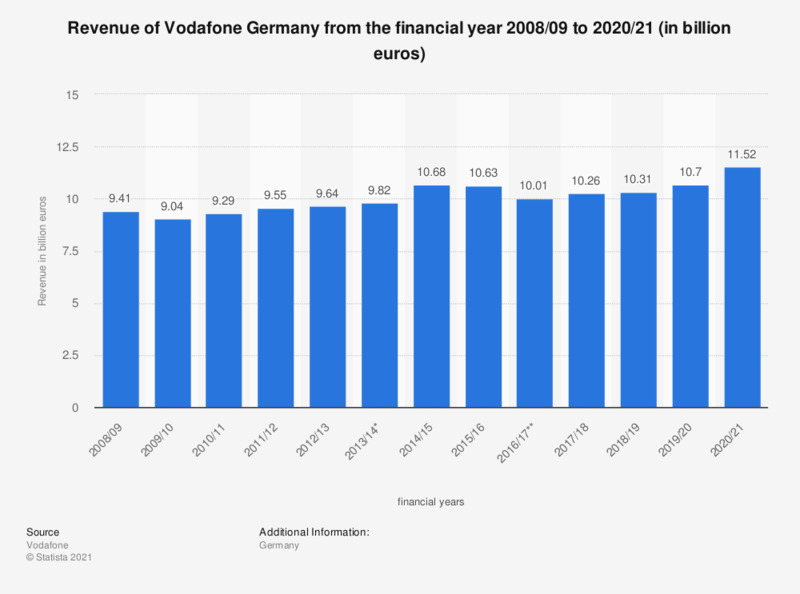 This statistic shows the revenue development of Vodafone in Germany from the financial year 2008/09 to 2017/18. In the financial year 2017/18, Vodafone Germany generated revenues of roughly 10.26 billion euros. The financial year ends March 31. * According to the source, the figures include service revenues stemming from the acquisition of Kabel Deutschland: 457 million euros in Q4 and 844 million euros for the whole financial year, respectively. ** Vodafone does not provide a total revenue figure starting 2016/2017. The figures presented here refers to service revenue. A time series of service revenue can be found here.